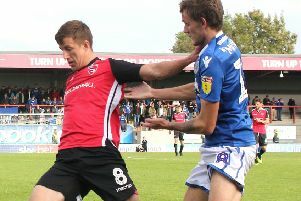 Morecambe's miserable week continued with defeat against fellow strugglers Forest Green that saw them slip into the bottom two. In a week where the off field problems have once again taken centre stage the Shrimps failed to score once again on another poor afternoon. The home side took the lead onn the half hour with a well worked goal. The Shrimps failed to clear their lines from a corner and Keanu Marsh-Brown took advantage by linking up well with Isaiah Osborne with a neat one two that ended with Marsh-Brown slotting the ball under Barry Roche. Their second was almost comical on 63 minutes. Morecambe had been forced to substitute Barry Roche with a head injury and Dan Nizic’s first action was to pick the ball out of the back of the net after Scott Laird’s inswinging free kick from te right beat everyone and ended up in the back of the net. The goal came just after Morecanbe’s best period of the first half where they should have taken the lead when Vadaine Oliver was presented with a golden chance six yards out but volleyed against the foot of the post. Oliver was in action in the first minute when he was put through on goal and fired straight at home keeper Brad Collins. Aaron Wildig failed to find the tyarget when found free on the edge of the box and Forest Green defender Jack Fitzwater produced a fine clearance from Aaron McGowan’s dangerous cross. Forest Green: Collins, Bennett, Collins, Fitwater, Laird, Traore (rep Bugiel 78), Osborne, Marsh-Brown (rep Moiinthe 78), Iacovetti, Brown, Doidge. Subs not used: Pickering, Randall, Roberts, Gomes, James.